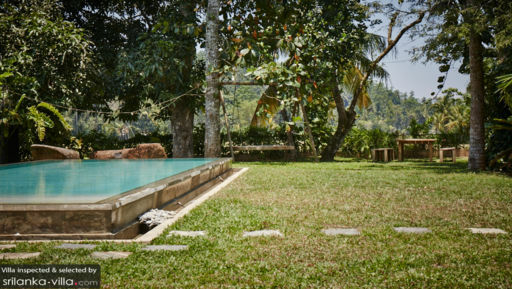 A short drive from the historical city of Galle, located in the village of Metaramba is The Petals villa surrounded by emerald fields and featuring expansive gardens flush with tamarind and mango trees. The stunning, two-bedroom villa is a colonial-inspired structure with white-cream interiors, large spaces, flowering trees marking the façade, and a serene ambiance. Found near the UNESCO World Heritage Site, the Galle Fort, guests are free to explore the neighbouring cities and also to spend quality time indoors, just lounging by the pool! The Petals is home to two comfortable and cosy bedrooms that are furnished with four-poster king-sized beds, fitted with quality bedding and plush mattresses to ensure a good night’s rest. The bedrooms feature white interiors for a spacious layout and the walls of the rooms are donned with wall tapestries depicting vibrant flora and fauna. There are shelves on shelves holding bestsellers, magazines, and other books for you to read at your own leisure. The bedrooms are air-conditioned to keep them cool and comfortable, especially during the afternoons. Each of these two bedrooms comes with very own en-suite bathroom, which is not only convenient but more efficient for all guests staying at The Petals. With lavish and well-manicured gardens sprawling out front, there is plenty of room for a BBQ or a picnic on the freshly-cut grass. The beautiful gardens are grown with mango and tamarind trees, and you will see flowers strewn across the velvety surface, especially when the wind takes over. A 10-metre swimming pool sits snuggle towards a side, so you can swim all you wish, or take a breather while you lounge on the hammock or wooden swing. There are sunbeds for sunbathing and tanning purposes. An outdoor bench area serves as an alfresco dining spot, perfect for eating under the stars! The open-plan living area at The Petals allows you to make the most of your naturally-abundant surroundings as you can enjoy an unhindered view of the unassuming beauty of luscious foliage that surrounds the villa. The living area is furnished with comfortable, lounge-worthy sofas and chairs that are great for resting and relaxing. There are plenty of books, collected over the years, for you to indulge in as you snuggle up on the couch, breathing in the fresh air and recuperating. The dining area is another open-air space with a view of the garden and pool outdoors. It comprises a table with a rustic, terrazzo table-top which will be serving the best of Sri Lankan food to guests of the villa! A fully-equipped kitchen showcasing striking black interiors is also found at the villa, as it is fitted with many modern amenities and appliances that you can make use of to cook up a storm no less! There are numerous services on offer at the villa, including personal guest assistance so that individual guests have everything they need and require. 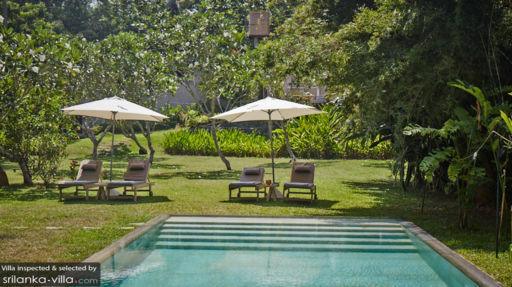 The villa offers housekeeping, garden maintenance, and security for guests. Requests like laundry, massages, personal chefs are available if you need them and at an additional cost. Since the villa is child-friendly, they even offer baby cots and babysitter as and when needed! 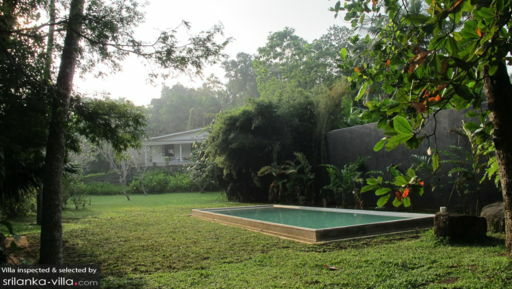 The villa is located in a serene location surrounded by fields of green so you can enjoy a peaceful and tranquil holiday. It is a short drive from the city of Galle, where you have the luxury of visiting the renowned Galle Fort and the other colonial-era buildings in the city. There is Rumassala Mountain not far from the villa where the more, adventurous guests can climb up its peak for a ravishing view of Sri Lanka’s harbour, especially during sunset! I cannot say enough great things about The Petals. It was a little slice of paradise. We stayed for 8 days and barely left the villa as it was so nice. Everything has been so well thought out and considered, the design is fabulous with good quality linens and bedding and everything is just so comfortable. The gardens are lush with so much wildlife kicking about: peacocks, monitor lizards, our very own turtle, so many birds...it was just gorgeous. The swimming pool was perfect with views over the paddy fields. Upul and Jagath, who look after you while you're there, are both so wonderful and make sure that your every need is catered for. Upul cooks all your meals for you and he is the most amazing chef. Seriously the best food we ate during our whole trip to Sri Lanka. I cannot recommend The Petals highly enough and I will definitely be back! !